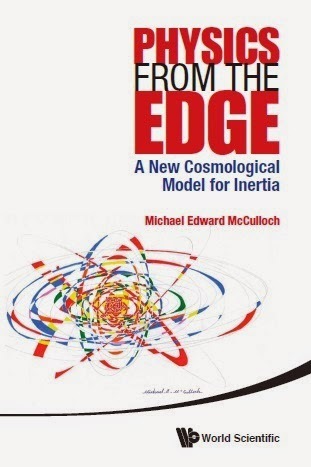 Physics from the edge: MiHsC & emdrive: a new approach. MiHsC & emdrive: a new approach. In previous work I've offered an explanation for emdrive in terms of MiHsC operating on the light within the emdrive cavity (see McCulloch, 2015), and I have not abandoned this photon based approach (I'm now convinced it is better, but might benefit from the diagram below). However, in the past couple of days I've wondered whether I can do it, probably with the same maths, by looking at the cavity instead and forgetting about the light, except as a source of vibration. This schematic shows what I have been considering. It shows, on the left, a cubic cavity (black box) accelerated left (upper panel) and right (lower panel) by the microwaves in the cavity. In each case a Rindler horizon (red curve) appears in the opposite direction to the acceleration and MiHsC then damps the Unruh radiation more on that side (see the red dashed line which shows the decrease of power in the Unruh spectrum going towards the horizon, ie: the red line trends down). This gradient in the Unruh spectrum then pushes the cubic cavity in the opposite direction to whatever acceleration it had and thereby gives it inertia (McCulloch, 2013). Now look at the emdrive cavity (right hand side). 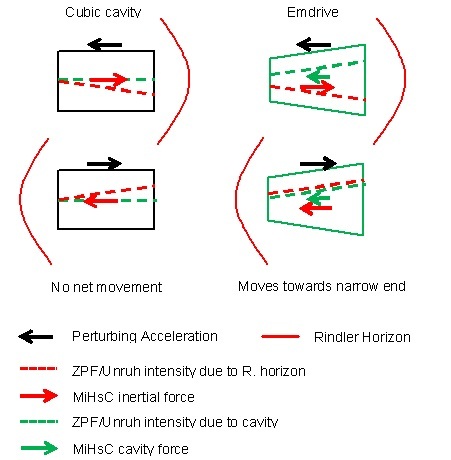 Again we accelerate it left and right, and again the Unruh radiation spectrum decreases towards the horizon making a force that counters the initial acceleration, but now the cavity itself, assuming it's like a horizon and MiHsC applies, also damps the Unruh radiation more at the narrow end (see the green dashed line, which shows decreasing power towards the narrow end). This then, for both left and right acceleration pushes the emdrive towards its narrow end. The acceleration is essential, because without it you wouldn't have the Unruh field and the cavity wouldn't be able to make it asymmetric. This is a different way of thinking about it than using photons, but it uses MiHsC in the same way and cuts out having to worry about light which is difficult to visualise. Comments welcome! McCulloch, M.E., 2015. Can the Emdrive be explained by quantised inertia? Progress in Physics, 11, 1, 78-80. Link. I would like to applaud you for thinking outside of the box and flatly denying the EMDrive can't do what several tests have confirmed and so many others have called bunk. While I might have a tough time grasping your Unruh radiation I'm willing to learn and not be closed minded. Something is happening within the EM Frustum Cavity that defies classical physics (40 year old engineering education here) and you know I'm ok with it pushing the boundaries of knowledge and understanding. let me try to explain my understanding. 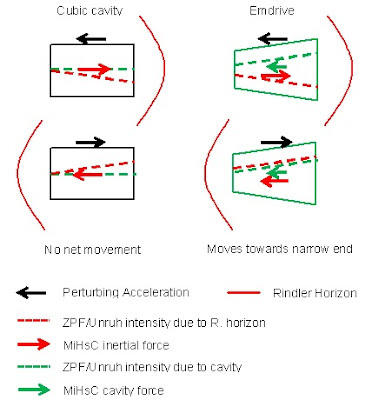 the moment when mDrive works is when the photons bounce and thus try to accelerate he cavity. depending on the side, they hare more or less "heavy" ? what is the effect of a dielectric as nasa EW have tested,which have an effect ? what is the effect of absorption of phoons by losses ? is it just ending the game for photons, who cannot play the game of heavier on one side, or is it a key ? If the photons are simply a source of vibration, then would we also see an effect from vibrating a metal cavity with sound waves? Eirinn: very good point. Before answering it I need to work out the full derivation, which I'm struggling through now..
Hm. I'm already tending away from this solid-state view because the acceleration of the cavity is unlikely to be large enough to create Unruh waves short enough to interact with the cavity. The schematic is still useful as a visualisation, but for photons. I'm sure you have seen the conversation on NASA's blog site but little or no thrust is made when the RF input into the cavity is at peak Q but a little off and it looks like it's a lower frequency. Notice that at a Q only 2/5 of the higher one (7320 instead of 18100) resulted in greater than twice as high a thrust force (116 instead of 54). Mike, you might want to take a look at 'Notsosureofit's' latest effort - a chart that seems to be a bit of a breakthrough. Has to do with accelerating photons. Rodal and others seem to think this is critical. Hi Mike, when you say that MiHsC is very sensitive to the frequency, you are talking about the Unruh waves rather than the microwaves, correct? From your paper it appears that Unruh wavelengths are not dependent on the microwave wavelength. In that case, we can't tune the Unruh freqencies to the box, but rather there is an optimimum size for the big and small diameters. Eirinn: Yes, I do mean the Unruh frequency. The Unruh wavelengths are not dependent on the microwave frequency (I'm assuming that the acceleration that produces the Unruh radiation comes from the photons bouncing back and forth in the cavity), but it seems resonant microwaves are crucial to the effect so their wavelength should be tuned to the cavity. The Unruh waves are similar to the size of the box, and this falls out of the maths, so any sized box will do, so long as the microwaves resonate. There's a project on hackaday.io that attempts to build a smaller version of the emdrive (https://hackaday.io/project/5596-em-drive). They should be doing test runs next this week. Thanks Martin. I've followed them on hackaday.. So, what would be the optimal cavity shape and dimensions, according to your interpretation? MiHsC implies the following: The ideal is not a sharp cone, as my simplified 1-d equation implied (because there's no end-end bouncing). The ideal is the usual truncated cone with two flat (or ideally curved facing) surfaces. If using flat surfaces the width of the big end (wb) should be longer than the axial length of the cavity (l) so that the Unruh waves set up by the photons bouncing between the ends (some taking a diagonal route longer than l) 'fit' at the wide end, but not at the narrow. I can give a formula for wb=fn(l,ws) It could be set up with baffles at the short end to further break up waves there. It could be set up 'short' so that l~ws (width of the small end) instead, so the Unruh wavelengths fit better at the short end and deliberately de-harmonise the wider width, then there may be a smaller reverse thrust, but this is likely to be difficult to achieve (note: this is all approximate since I don't have a full 3-d model). What is the relationship between the axial length of the cavity (l) and the wavelength? The data in your post "MiHsC vs EmDrive data: 3d" doesn't show a clear relationship between the two, e.g. a cavity length that is a multiple of some fraction of the wavelength. I was wondering if there would be a way to calculate the optimal cavity for a given wavelength. As for baffles, are you suggesting something like concentric rings protruding from the surface of the small end? There are two wavelengths here that are probably related. The wavelength of the EM radiation, which needs to resonate in the cavity. Then the wavelength of the Unruh waves produced by the back and forth photon accelerations, that MiHsC assumes causes their inertia. The Unruh wavelength is 4*l, where l is cavity length. The baffles should hopefully not interfere with the end-end wave propagation but should disallow lateral waves, so their spacing should be a non-multiple of the wavelength. Yes, concentric rings might do it, dependson their spacing. The curve of the end plates should be concentric, so curved the same way, so the side view looks like a slice out of an annulus. This is so that l is the same for all end-to-end photons & so the Unruh waves are more focused on one wavelength (4l) which can then be tuned to the size of the wide end. Why is the Unruh wavelength dependent on the cavity length? Isn't it dependent on the magnitude of the acceleration, which in the case of bouncing photons simply proportional to C? Photon acceleration, if we can imagine such a thing, is a=dv/dt. So imagine a photon in the cavity going at speed c rightwards then bouncing back from the end to go at speed c leftward. Then a=dv/dt=2c/(l/c)=2c^2/l. The wavelength of Unruh radiation is lambda=8c^2/a=8c^2/(2c^2/l)=4l. Why should it matter that it resonate at a particular frequency? Is it just to have enough photons bouncing back and forth to transfer momentum from the shift in inertial mass? If so, wouldn't it just be the amount of photons in the cavity? Is it somehow the resonation that makes the cone opaque to Unruh radiation, forcing more to fit inside the larger end? Hi Mike, sorry to keep going back on this topic! I'm unsure why the time component of the acceleration is (l/c). This suggests the photon accelerates along the length of the cavity, but I thought it the acceleration would be effectively instantaneous because the photon just bounces off the metal. Good point. This is the average acceleration over time..so that is an assumption. Surely the Unruh waves are emitted only during the acceleration period? It then doesn't make sense to average the acceleration over an arbitrary length of time. I'm considering your point, but in fact I see it the other way. The average over a single end-end pass is not arbitrary and is well defined. What would be arbitrary is calculating the acceleration during the reflection process itself. What is that time? How could you ever decide what it is? So I regard what I've done as less arbitrary.. Yes, I agree with that - but on the other hand, inertia is only present/effective while acceleration is occurring, so MiHsC is only significant during that time. Once the photon has bounced and is travelling along the cavity, surely it's no longer affected by Unruh waves? You're right: an average is not a good physical parameter. I'll have to think it over. Thanks for the comments.